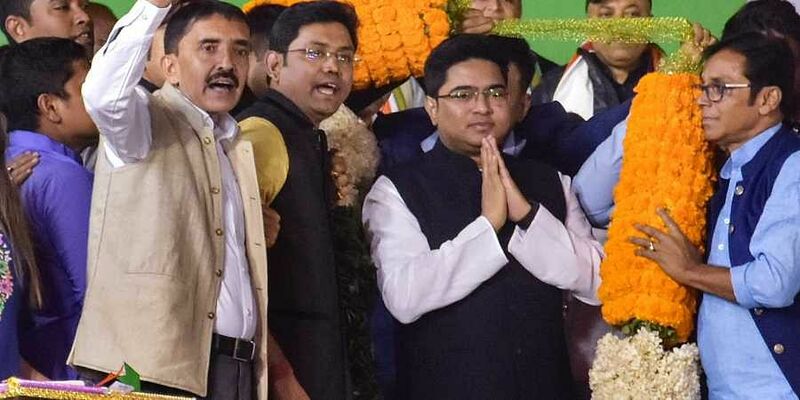 KOLKATA: Senior TMC leader Abhishek Banerjee Friday challenged BJP national president Amit Shah to contest coming Lok Sabha polls from West Bengal. Banerjee, MP, said that people of India are looking up to TMC supremo and West Bengal Chief Minister Mamata Banerjee to lead the nation after 2019. He questioned why Shah didn't have the guts to conduct a press conference Thursday when Alok Verma was still CBI chief. In an apparent reference to the switchover of party MP Soumitra Khan to BJP, Abhsihek Banerjee said the those who have rejected by the TMC are treated as "gems" in BJP. "Those who have been rejected by TMC, who are basically not but garbage on our party, all of a sudden have become gems in BJP. This is the condition of BJP in Bengal. I can assure all of you that BJP won't win even a single seat in Bengal," he said. He (Shah) was conducting a press conference Friday if he had the guts he should have conducted it Thursday when Alok Verma was still CBI chief, Banerjee said in an apparent reference to uncomfortable questions that have been raised against BJP over the Rafale fighter jet deal. Banerjee, who is also nephew of Mamata, said the countdown for the "anti people" Modi government has begun. Mocking the defeat of BJP in three hindi heartland states, Banerjee said BJP for last 4.5 years gave used CBI and ED as a tool to silence political opponents and detractors but has failed to do so with TMC. "The TMC is the only political party which has not surrendered before the intimidation tactics of BJP. The more they threatened us with CBI and ED the more stronger we emerged by defeating all threats and intimidation," he said. Bandopadhyay criticised Prime Minister Narendra Modi for giving nominal time to the parliament and not delivering a single speech in the winter session of the Parliament. "We have never witnessed such an incident where Prime Minister comes to parliament just for few minutes and doesn't deliver a single speech on any of the issues. Where are we heading to. The people of this country should take a call in the next Lok Sabha polls," he said.